The editor of i is proud to be scooping awards at a newspaper that delivers on its advertising promises, Alasdair Reid reports. It was something of a surprise to see The Independent's quality concise newspaper, i, winning the Best New Brand in the Marketing Society Awards for Excellence 2012. Not because it is in any way undeserving - it clearly is. No. The surprise is that it is still eligible for a "new brand" award - the newspaper already seems such an established part of the media furniture. It is a nice surprise, though, because it gives us an excuse to interview Stefano Hatfield, a former editor of Campaign and now the editor of i. He admits that morale is rather high these days. "Winning awards is always nice," he says. "It makes everyone feel good. It's a great feeling sitting in a newsroom when things are going well." And the interview is also timely for other reasons - there are those in the advertising business who feel Hatfield has never quite received the credit and profile he has deserved in making the title a fixture in such a short time. Nothing sinister here. 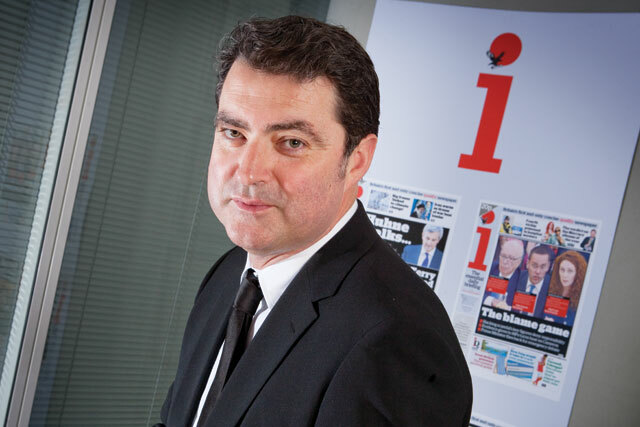 It's just that when i launched in October 2010, The Independent's then editor-in-chief, Simon Kelner (a dominant personality, if ever there was one), was keen to establish and maintain brand congruence between the mothership and its brand extension, so he remained the face of both products. And let's also acknowledge here that the initial idea and founding blueprint behind the launch of i came from Andy Mullins, the group's managing director. But Hatfield was the man charged with making it happen on a daily basis; and now that Kelner has moved on to head up The Journalism Foundation and has been succeeded on The Independent by Chris Blackhurst, we may be hearing more from Hatfield. Because Hatfield, of course, has almost unparalleled expertise in the business of innovation at the concise end of the newspaper market. In 2004, having left Campaign a few years earlier to work for Ad Age International in New York, he landed the job of launch editor on the New York edition of the commuter freesheet, Metro. As a journalist, he already had long-standing relationships with Metro International bosses - and they had always liked the cut of his jib. But still, it was undoubtedly a risk appointing someone with no hard-nosed newspaper experience. Hatfield did not let them down. And then, when he decided the time was right to return to the UK, he once again found himself in the right place at the right time, being invited to join the development team behind News International's thelondonpaper. He was launch editor when the first edition hit the streets in 2006. As the editor of i Hatfield completed his hat-trick. The title, a concise quality newspaper selling for 20p, quickly achieved its sales target of 150,000 copies, much to the astonishment of the doom-mongers, and has continued to put on circulation. The April circulation figure was just over 270,000 and, at the time of speaking, Hatfield was confidently expecting more good news in the Audit Bureau of Circulations figures for May. Indeed, last week's results show the paper has notched up an extra 3,000 copies. Lots of thoroughly modern editors claim they are switched on to commercial (and particularly advertising) issues, but the truth is that Hatfield, in background and temperament, remains unique. And this is one of the factors that has helped The Independent brands emerge as the pre-eminent liberal-left news voice in the country - a situation that would have been unthinkable a decade ago when there was long-running speculation that the story might soon be drawing to a close for the newspaper group. The big-picture turnaround in fortunes is, of course, largely a testament to the Lebedevs, father and son, who acquired The Independent stable in 2010. Having worked their magic on the London Evening Standard too, the proprietors have come to represent a major font of optimism in a UK media market that tends these days to be pessimistic, defeatist and devoid of good ideas. Hatfield is also anxious for us to give adequate credit to the marketing team and i's advertising agency, McCann London. "They really know what they're doing," he says. "They understand the brand very well. They know you can't fool readers. We are very much about giving readers what they want - and I believe very strongly in advertising that promises the product will do exactly what it says on the tin." Two television ads, one featuring Jemima Khan and Dom Joly, the other featuring Mark Steel and Ronni Ancona, have played an important part in establishing the brand - and they have been almost miraculously effective, especially given the small media budgets involved, with sales growth continuing long after campaign bursts have ended. Hatfield says that no-one is getting ahead of themselves. But he concludes: "We are never going to sell two million copies. But can we get to 300,000? We hope so. Then 350,000 or 400,000? Who knows?" All-time favourite campaign: Levi's by Bartle Bogle Hegarty, the boy-meets-girl years, especially "swimmer"